In the last part we had gone over some ground work on how to build a fast robot. If you had missed it you can read it here. So this time lets start with some robot building, like in previous article our target was a fast, small robot capable of solving problems like mazes , line following , soccer , picking and dragging things etc. When building we will go over the headings covered last time and pick items appropriately. The best commercial example of a robot which somewhat fulfills our requirement is the 3pi robot. But 3pi does have some caveats , mainly for us it is that it will not be allowed in any Indian competitions as it is a full robot kit also not really expandable or easily modifiable. 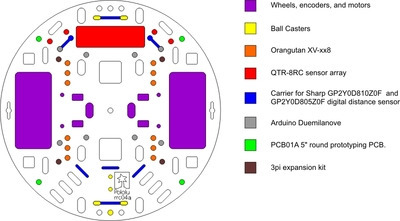 Almost all components other than the custom PCB can be bought online, even the custom PCB can be upgraded to a Robot Controller and doesn’t really need design , this is to speedup developments time and help those who are mechanical and electrically handicapped. But I will make my own PCB which I think will fit the bill of most competitions. Planning – We will for a start simply clone the concept of 3pi robot and make it better. The 3pi robot is already optimized for line follower and maze solving but we will build robot which can do more with somewhat similar specifications. Money – From initial estimates it should cost you about USD 100+, this is due to the fact that most items will have to be imported. 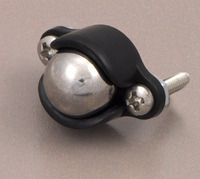 The main costs are due to light weight and high performance material. Winning a single competition will cover all your expenses easily. With prizes of some competitions running as high as Rs 50000. Hardware – Pololu the makers of 3pi also gives a set of components which can be used to build a better faster robot. So to make it easier and cheaper we will stick to them for most components. 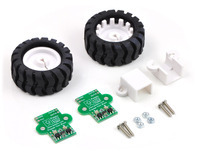 We will also order a few other stuff from vendors like Hobbyking and sparkfun which Pololu does not carry. Also another major reason for choosing non Indian vendors is due to their open nature (main reason),higher quality and community interaction. Also transparent ones allow led lighting to make the whole chassis glow. Looks cool and can be used to indicate a swarm bots status . Small enough to fit in size requirements of almost all task based robot requirements. As the chassis is 5 inches , We will on the same lines of 3pi name our Robot Only5. Motos and Wheels – We need speed with good traction wheels, improving on 3Pi we will stick to micro metal motors with appropriate wheels and encoders. We will be using motors similar to 3pi robot but the HP variant which has higher RPM and more power at higher current cost. So we will start with 30 RPM Micro Metal HP motors, 3pi uses Normal 30 RPM ones. 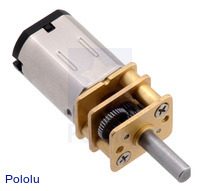 For mounting ,encoders and wheels a pack is available from polulu which compliments the motors very nicely and have a tight fit on the chassis we have decided. As two wheels by them self are not balanced we will need caster's. We will buy two as for objectives where picking and dropiing etc is required a 3 wheeled robot is not really stable. Its cheap for integrated Atmega 328 and Good HBridge on same chip. Well documented and all semantics etc are available online. Has most features we want PWM , ADC , good flash and ram , h/w QEI is missing but we will manage at such price. I recommend buying the programmer combo , as programmer is really really Fast. Not the cheap uabasp which Indian vendors sell which i find very slow. Its is Full Speed USB2.0 , gives a oscilloscope and serial port as addon. Good value for money. 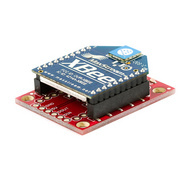 Communication - Though not currently required.We will be using xbee from Digi in our RF builds, There are cheaper alternatives which cost a little less but xbee’s give the best price/performance ratio than any other we tested. Also they allow you to upgrade from a few hundred feets of RF connectivity to miles without changing your code.And simple AT commands and easy serial link make it the choice for us. We bought a pair from spark fun to establish communication b/w our robot and our PC. 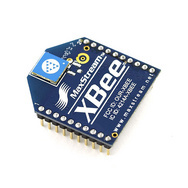 Two xbee modules are needed , one xbee explorer Regulated and one xbee Explorer USB. Sensors – For our first build we will not be using any. As we go on we will integrate various sensors for various objectives. Powers supply – The controller board has about 100mA of output capability so we will put in our own small 5V converter using the easily available 7805 with reverse polarity diode and two bulk capacitors. 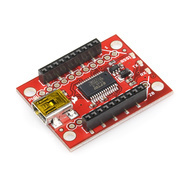 HBridge – Taken care by our controller board it has 1.2 A continuous and 3A peak capability. Though care should be taken to not drive motors into a stall. When dealing with Lithium based batteries please invest in a charger and do not try to take shortcuts. Also buy atleast 3 - 4 packs. PCB and Wiring - We will do a DIY PCB customized for our needs, in this tutorials we will make the PCB to have maximum expandability while giving easier connectivity. For wiring we will use the FRC cables , they have 1.4 A+ rating,But for connecting motors and batteries we will use a simple 4 pin molex and a 2 pin molex , at 24 AWG it has about 3.5 A current rating enough for our small motors and power supply. Using ribbon cables also keeps you robot very clean. This article carries with it the PCB design and schematic built for the Orangutan 328 we bought earlier. Some Features of the custom PCB designed . 1A 7805 based power rail for driving servos and other sensors. 10 pin FRC for ADC connections to Line sensors or obstacle sensors. Software - We will look into cutting development time by looking for reusable libraries and write what actually matters.Polulu actually provides most of the libraries for free which are easily customizable for most objectives we have in mind. Software will be covered in detail in next part. A Preview of the robot built and it running at about 80% speed. It does 1.5 m + easily in a second so our main target is taken care of. Here the Robot is doing 1 second motor burst , with old 7.4v 2000ma batteries which i found lying around. (500ma fully charged it will do better, i do not have these right now as Hobbyking messed up my order ). Next time we will assemble it,calculate final Bill of Materials and get it moving. only the thing is little bit costly,so if possible lower it's cost by some alternate device..